The queen of controversy is in deep s**t once more. To me, this ain’t news because she is capable of doing nasty things. Her worst cannot and will never be measured. A few days ago, she bitterly fought with Huddah Monroe after she (Huddah) said that she has been working hard to get her income through farming. Vera begged to differ claiming that Huddah had downloaded the photos she was using to ‘cheat’ the public. Vera has now got a dose of her own medicine. 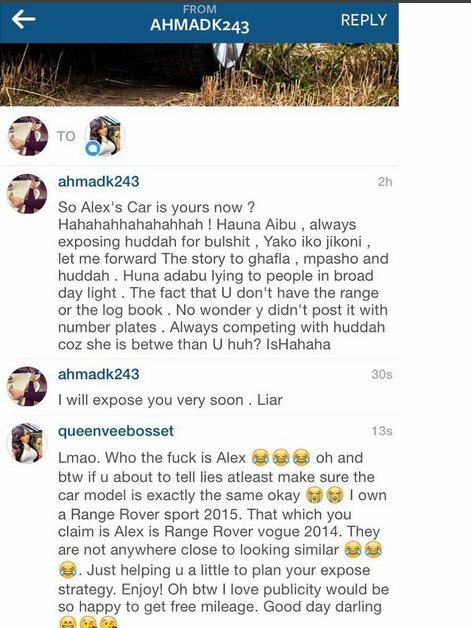 Someone came out of the blues, calling Vera a liar and claimed that Vera does not own the range rover.